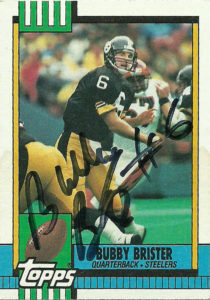 Bubby Brister is an interesting signer, as he only signs once at the end of the year. He’s been handling it this way for a few years now. If you are lucky you can get him in about 10 days flat. If you are not so lucky, you send in mid-January and wait until the end of the year. 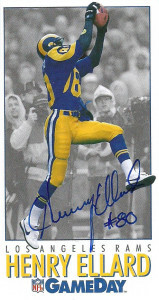 Still he is a reliable signer and he’s got some great cards out there in his Steelers uniform. Anything else feels a bit odd. Bubby bounced around colleges before landing at NW Louisiana. This was thanks in part to committing to play baseball (Tigers) out of high school and not accepting a scholarship to Alabama (1981). He played 39 games in the Appalachian League for Bristol but decided to go back to college in 1982 to Tulane. He’d initiate the paperwork to transfer to NW Louisiana in 1983. Brister was the starter for one season in 1985. He was 191 of 342 for 2,880 yards, and 17 TDs to 14 interceptions. The Steelers felt that Brister was a good developmental prospect. He had the tools in order to make it at the pro level. Pittsburgh dropped a 3rd round pick on Bubby, and he’d play sparingly his first 2 seasons. The Steelers had long suffered at the QB position after the retirement of Terry Bradshaw. This continued into the 1988 season, where Bubby finally showed signs of maturation. He threw for 11 TDs and 2,634 yards and showed some moves in the pocket rushing for an additional 6 more. 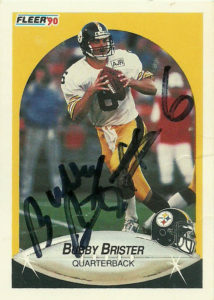 I laughed at the Steelers at the beginning of the season, as Brister was inaccurate (47.5% completions and 14 interceptions), but he had the last laugh against the Houston Oilers in the playoffs. A gunslinger, Bubby had a strong arm and a penchant for the long bomb. He led the Steelers to an 8-6 mark and a 9-7 mark as a starter the following seasons. During his 1990 season, Brister had a career high 2,725 yards and 20 TDs to only 14 interceptions. Bubby was unable to completely duplicate his success in that 1990 season, as he’d be limited to only 8 games in 1991 due to a knee injury. He’d never start a full 16 game slate again. 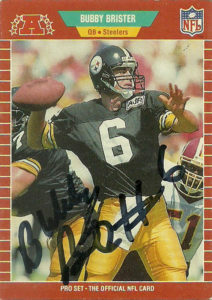 After playing for the Steelers through 1992- Bill Cowher’s rookie head coaching season, Bubby was allowed to test the waters of free agency in 1993- as the team was comfortable with current starting quarterback Neil O’Donnell. Thus began the journeyman phase of Brister’s career. Bubby signed with the Eagles in 1993- where he’d back up oft injured Randall Cunningham. He’d post a 4-4 record in relief of Randall throwing 14 TDs to just 5 interceptions, and raising some eyebrows. Brister played one lone forgettable season for the Jets in 1995, and then hopped over to Broncos. In Denver, Bubby stayed for the next 4 seasons. Brister came on during the clutch posting a 4-0 record for the Broncos in relief of John Elway and helping the team win the Super Bowl in 1998. He’d retire after one final season in Minnesota (2000) and as of 2018 lives in his home state of Louisiana. Henry Ellard gets no respect. 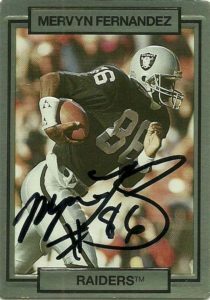 At the time of retirement the highly decorated wide receiver was ranked 3rd all time in NFL history with 814 receptions and 13,777 yards. To boot he also had 65 receiving TDs, 15,718 total yards from scrimmage, and cracked the 1K barrier receiving 7 times. Still thanks to a logger jam at the position – even from Ram receivers from a different generation (Torry Holt, Issac Bruce), Ellard has not gotten the nod that he deserves to be in the Pro Football Hall of Fame. Henry enjoys coaching and has been doing it for sometime now at both the pro and at the high school level. 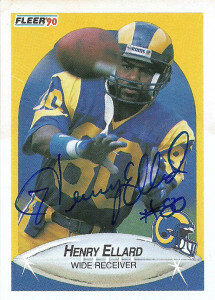 Great cards here of Henry. I love the Fleer 1990 card of him leaning through the shot. Forget the fact that its obviously a warmup shot with his chinstrap undone. The yellow border helps frame the image well, and the ink of the autograph took to this card well. Ellard has a superb autograph with a unique ‘H’ and strong loops. It goes beyond saying that his signature also receives high marks for legibility and care. The GameDay 1992 is a nice shot of Ellard going up for a grab. Graying out the background is a nice touch to get the subject to jump off the canvas. Now that takes all of 30 minutes and a mask to do in Photoshop, but back in the early 90s- it was still a creative feat. After failing on Henry numerous times, I was able to track him down and knock him off on these two cards. Other fans followed my initial request, with some abusing him for 8-10 autographs per request. As evidenced in the past, within a year he was returning mail and/or had moved on to a new location. 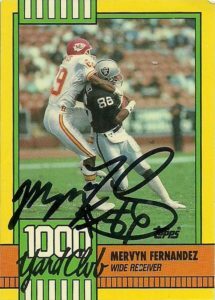 Ah, Mervyn Fernandez, such an underrated receiver. After proving his worth in the CFL for the BC Lions, Fernandez showed up to the NFL in 1987. 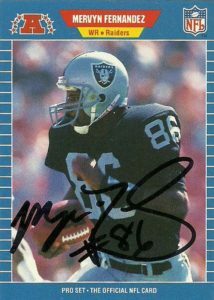 A shrewd selection by Al Davis in the loaded 1983 draft, Fernandez was picked by the Raiders in the 10th round. After a few years with the Raiders, he returned to the BC Lions to finish out his career in 1994. Always well remembered by the CFL, he’s received numerous accolades from the league since retirement. Fernandez has some great cards. His Score 1989 Supplemental is really nice. The color on this card is outstanding, even without adjustment. 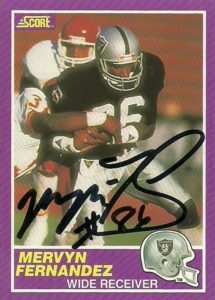 The Action Packed 1990 card was a really solid shot of Mervyn. It’s a dynamic action shot of him although the framing was typical of most cards of that era with the color framing in gold. The ProSet 1989 was really the card set that blew the doors off of Topps stranglehold on the market. It’s a great card through and through however it suffers from the offset cutting issues that plagued ProSet throughout most of its print cycle. Topps inserted a nice glossy 1000 yard club card at the top of every pack which all had solid action shots of their players. After I ran out of Action Packed cards to buy at the 7-11 everyday after school, I’d slowly soak in the Topps cards. Mervyn’s autograph certainly stuck out nicely on this canvas.